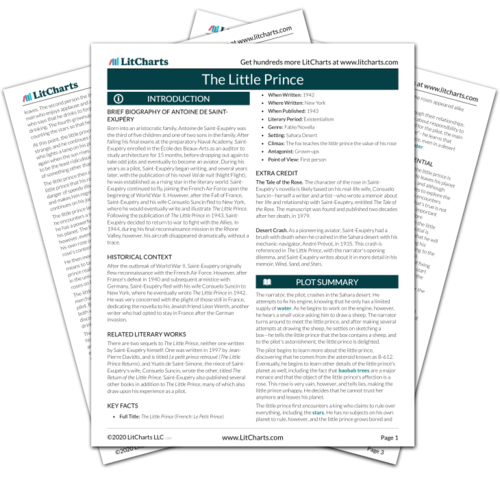 Instant downloads of all 945 LitChart PDFs (including The Little Prince). LitCharts assigns a color and icon to each theme in The Little Prince, which you can use to track the themes throughout the work. The little prince decides to explore other asteroids in order to increase his knowledge. The first one he comes across contains a king, who's delighted to have a subject to rule at last. The little prince yawns before the king, who orders him not to yawn—however, when the little prince says that he cannot help it, the king revises his order, demanding that the little prince yawn. The little prince, frightened, says he cannot do that either, so the king becomes vexed, trying to come up with a reasonable order for the little prince to obey. The king is the first grownup the little prince meets, and he showcases the irrational desire of grownups to be obeyed. This need in the king is so great that he will revise his orders endlessly just so that they definitely will be obeyed. In other words, the king displays no leadership. He just wants to see, in his own narrow-minded view, that the prince is obeying him. After the little prince sits down, he wonders what the king actually rules over, since there are no subjects on the planet. The king responds that he rules over the entire universe. Impressed, the little prince asks the king to order the sun to set, since he is sad about leaving his own little planet. The king, however, says that it would be unreasonable for him to order the sun to set until conditions are favorable—which will occur at approximately twenty minutes to eight. The king says that he rules the entire universe—when the truth is that he shapes his orders to obey universal rules. Bored, the little prince decides to move on to another planet. The king desperately tries to get him to stay, first making the little prince a Minister of Justice. The little prince objects that there is no one on the planet to judge and gets ready to leave. At the final moment, as the little prince departs, the king calls out that he has made the little prince his Ambassador. The little prince sees through the king's faulty logic and gets bored. The king, in his adult desperation to rule over something, tries to prevent the little prince from leaving and finally settles on naming the prince his ambassador, in order to create the illusion that the little prince, in traveling away, is following the king's orders. Cao, Diana. "The Little Prince Chapter 10." LitCharts. LitCharts LLC, 17 Nov 2013. Web. 23 Apr 2019. Cao, Diana. "The Little Prince Chapter 10." LitCharts LLC, November 17, 2013. Retrieved April 23, 2019. https://www.litcharts.com/lit/the-little-prince/chapter-10.